The Great Mosque of Mecca (Arabic: ٱلْـمَـسْـجِـد ٱلْـحَـرَام‎, translit. al-Masjid al-Ḥarām, lit. 'The Sacred Mosque') is a mosque that surrounds the Kaaba in the city of Mecca, Saudi Arabia. It is a site of pilgrimage for the Hajj, which every Muslim must do at least once in their lives if able, the rites of which includes circumambulating the Kaaba within the mosque. It is also the main phase for the ‘Umrah, the lesser pilgrimage that can be undertaken any time of the year. The Great Mosque includes other important significant sites, including the Black Stone, the Zamzam Well, Maqam Ibrahim, and the hills Safa and Marwa. It is open, regardless of date or time. The Great Mosque is the largest mosque in the world and has undergone major renovations and expansions through the years. It has passed through the control of various caliphs, sultans and kings, and is now under the control of the King of Saudi Arabia who is titled the Custodian of the Two Holy Mosques. It is located in front of the Abraj Al Bait, the tallest clock tower in the world, the construction of which has been surrounded by controversy concerning the destruction of early Islamic heritage sites by the Saudi government. The Great Mosque contends with the Mosque of the Companions in the Eritrea city of Massawa and Quba Mosque in Medina as the oldest mosque. According to one set of views, Islam as a religion preceded Prophet Muhammad, representing previous prophets such as Abraham. Abraham is credited with having built the Kaaba in Mecca, and consequently its sanctuary, which according to this view is seen as the first mosque that ever existed. According to another set of views, Islam started during the lifetime of Prophet Muhammad in the 7th century CE, and so did architectural components such as the mosque. In that case, either the Mosque of the Companions or Quba Mosque would be the first mosque that was built in the history of Islam. According to the Quran, Abraham together with his son Ishmael raised the foundations of a house, which has been identified by commentators[by whom?] as the Kaaba. God showed Abraham the exact site, very near to what is now the Well of Zamzam, where Abraham and Ishmael began work on the construction of the Kaaba. After Abraham had built the Kaaba, an angel brought to him the Black Stone, a celestial stone that, according to tradition, had fallen from Heaven on the nearby hill Abu Qubays. The Black Stone is believed[by whom?] to be the only remnant of the original structure made by Abraham. After placing the Black Stone in the Eastern corner of the Kaaba, Abraham received a revelation, in which God told the aged prophet that he should now go and proclaim the pilgrimage to mankind, so that men may come both from Arabia and from lands far away, on camel and on foot. Upon Muhammad's victorious return to Mecca in 630 CE, he and his cousin, Ali Ibn Abi Talib, broke the idols in and around the Kaaba,[better source needed] similar to what, according to the Quran, Abraham did in his homeland. Thus ended polytheistic use of the Kaaba, and re-began monotheistic rule over it and its sanctuary. The first major renovation to the mosque took place in 692 on the orders of Abd al-Malik ibn Marwan. Before this renovation, which included the mosque's outer walls being raised and decoration added to the ceiling, the mosque was a small open area with the Kaaba at the center. By the end of the 8th century, the mosque's old wooden columns had been replaced with marble columns and the wings of the prayer hall had been extended on both sides along with the addition of a minaret on the orders of Al-Walid I. The spread of Islam in the Middle East and the influx of pilgrims required an almost complete rebuilding of the site which included adding more marble and three more minarets. During heavy rains and flash floods in 1621 and 1629, the walls of the Kaaba and the mosque suffered extensive damage. In 1629, during the reign of Sultan Murad IV, the mosque was renovated. In the renovation of the mosque, a new stone arcade was added, three more minarets (bringing the total to seven) were built, and the marble flooring was retiled. This was the unaltered state of the mosque for nearly three centuries. One of the entrances of the Grand Mosque, King Abdul Aziz Gate under construction as of January 2018 (right) it has been completed and made functional (Feb, 2019), King Abdul Aziz Gate as it stood after second Saudi expansion (left). 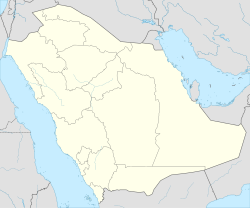 The first major renovation under the Saudi kings was done between 1955 and 1973. In this renovation, four more minarets were added, the ceiling was refurnished, and the floor was replaced with artificial stone and marble. The Mas'a gallery (As-Safa and Al-Marwah) is included in the Mosque, via roofing and enclosures. During this renovation many of the historical features built by the Ottomans, particularly the support columns, were demolished. On 20 November 1979, the Great Mosque was seized by extremist insurgents who called for the overthrow of the Saudi dynasty. They took hostages and in the ensuing siege hundreds were killed. These events came as a shock to the Islamic world, as violence is strictly forbidden within the mosque. The second Saudi renovations under King Fahd, added a new wing and an outdoor prayer area to the mosque. The new wing, which is also for prayers, is reached through the King Fahd Gate. This extension was performed between 1982 and 1988. 1988 to 2005 saw the building of more minarets, the erecting of a King's residence overlooking the mosque and more prayer area in and around the mosque itself. These developments took place simultaneously with those in Arafat, Mina and Muzdalifah. This extension also added 18 more gates, three domes corresponding in position to each gate and the installation of nearly 500 marble columns. Other modern developments added heated floors, air conditioning, escalators and a drainage system. In 2008, the Saudi government under King Abdullah Ibn Abdulaziz announced an expansion of the mosque, involving the expropriation of land to the north and northwest of the mosque covering 300,000 square metres (3,200,000 sq ft) . At that time, the mosque covered an area of 356,800 square metres (3,841,000 sq ft) including indoor and outdoor praying spaces. 40 billion riyals (US$10.6 billion) was allocated for the expansion project. In August 2011, the government under King Salman announced further details of the expansion. It would cover an area of 400,000 m2 (4,300,000 sq ft) and accommodate 1.2 million worshippers, including a multi-level extension on the north side of the complex, new stairways and tunnels, a gate named after King Abdullah, and two minarets, bringing the total number of minarets to eleven. The circumambulation areas (Mataf) around the Kaaba would be expanded and all closed spaces receive air conditioning. After completion, it would raise the mosque's capacity from 770,000 to over 2.5 million worshippers. King Salman launched five megaprojects as part of the overall King Abdullah Expansion Project in July 2015, covering an area of 456,000 square metres (4,910,000 sq ft). The project was carried out by the Saudi Binladin Group. On 11 September 2015, at least 111 people died and 394 were injured when a crane collapsed onto the mosque. Construction work was suspended after the incident, and remained on hold due to financial issues during the 2010s oil glut. Development was eventually restarted two years later in September 2017. In 2016, it was estimated that Great Mosque had cost 100 billion dollars. The Great Mosque is the main setting for the Hajj and Umrah pilgrimages that occur in the month of Dhu al-Hijjah in the Islamic calendar and at any time of the year, respectively. The Hajj pilgrimage is one of the Pillars of Islam, required of all able-bodied Muslims who can afford the trip. 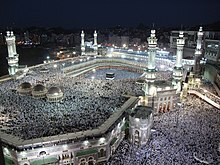 In recent times, over 5 million Muslims perform the Hajj every year. Some of the rituals performed by pilgrims are symbolic of historical incidents. For example, the episode of Hagar's search for water is emulated by Muslims as they run between the two hills of Safa and Marwah. The Hajj is associated with the life of the Islamic prophet Muhammad from the 7th century, but the ritual of pilgrimage to Mecca is considered by Muslims to stretch back thousands of years to the time of Ibrahim (Abraham). The Ka‘bah is a cuboid-shaped building in the center of the Great Mosque and one of the most sacred sites in Islam. It is the focal point for Islamic rituals like prayer and pilgrimage. The Black Stone is the eastern cornerstone of the Kaaba and plays a role in the pilgrimage. The Station of Abraham is a rock that reportedly has an imprint of Abraham's foot and is kept in a crystal dome next to the Kaaba. Safa and Marwah are two hills between which Abraham's wife Hagar ran, looking for water for her infant son Ishmael, an event which is commemorated in the saʿy ritual of the pilgrimage. The Zamzam Well is the water source which, according to tradition, sprang miraculously after Hagar was unable to find water between Safa and Marwah. Bayt Al-Mawlīd, the house where Muhammad was born, was demolished and rebuilt as a library. Dār Al-Arqam, the Islamic school where Muhammad first taught, was flattened to lay marble tiles. A dome that served as a canopy over the Well of Zamzam was demolished. Some Ottoman porticos at the Mosque were demolished, and those remaining are under threat. This page is based on the Wikipedia article Great Mosque of Mecca; it is used under the Creative Commons Attribution-ShareAlike 3.0 Unported License (CC-BY-SA). You may redistribute it, verbatim or modified, providing that you comply with the terms of the CC-BY-SA.